Among Washington, D.C., power players, everyone has secrets they desperately want to keep hidden,including Sean Serrat, a Supreme Court lawyer. Sean transformed his misspent youth into a model adulthood and now has one of the most respected legal careers in the country. But just as he learns he's on the short list to be nominated to the U.S. Supreme Court, his daughter, Abby, a talented and dedicated law student, goes missing. Abby's lifeless body is soon found in the library of the Supreme Court, and her boyfriend, Malik Montgomery, a law clerk at the high court, is immediately arrested. The ensuing media frenzy leads to allegations that Malik's arrest was racially motivated, sparking a national controversy. 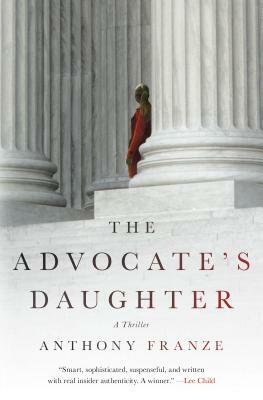 ANTHONY FRANZE is a lawyer in the Appellate and Supreme Court practice of a prominent Washington, D.C. law firm, and a critically acclaimed thriller writer with novels set in the nation’s highest court, including The Last Justice, The Advocate's Daughter, and The Outsider. Franze has been a commentator on legal and Supreme Court issues for The New Republic, Bloomberg, National Law Journal, and other major media outlets. He is a board member and a Vice President of the International Thriller Writers organization. Franze lives in the Washington, D.C. area with his family.